This month's "Boot of the Month" is Rory Gallagher's performance at the Open Air Festival in Jübek, Germany on June 2, 1989. Rory headlined the 3-day festival along with Van Morrison and popular German artist, Heinz Rudolph Kunze. 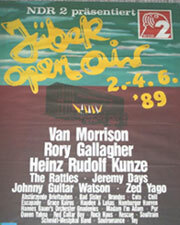 Jübek, a small rural town in northern Germany, hosted the Jübek Open Air Festival from 1985 to 1997. The town got its name from the Jütenbach stream that once marked the lower border of the Danish settlements in the region. With easy access by rail to the nearby cities of the Jutland Peninsula not to mention the densely populated metropolis of Hamburg in the south, the town was able to maintain the large influx of concertgoers necessary to keep the festival attractive to the big name acts. The festival grounds were also used for motorcycle racing, with World Speedway champion, Egon Müller just one of many who had taken laps around the dirt track that circled the grounds. By 1998 however, declining attendance figures had brought an end to the 3-day festival, and by 2005 the MSC dirt racetrack was gone as well. Since then, the area has been used primarily for flea markets and antique car shows. To read an interview of Rory in the June 5, 1989 edition of the Schleswiger Nachrichten (accompanied by my somewhat spotty translation) click HERE.